BARELY two months into the job, Madhya Pradesh Governor Anandiben Patel has firmly ensconced herself as a parallel power centre in the State vis-a-vis Chief Minister Shivraj Singh Chouhan. She asks bureaucrats with complete authority to comply with her instructions in time-bound manner, she meets delegations with aplomb and unambiguously raises questions on the State government’s inapt handling of sensitive issues such as malnutrition, safety of girl-child, law and order and incomplete development projects. Her unmistakable assertiveness has left the Chief Minister flabbergasted. On the other hand, Shivraj’s detractors within and outside the party are rejoicing the governor’s growing dominance over the Shivraj rule. Otherwise known for his skills to win over constitutional post-holders with all means-fair and foul, Shivraj seems to have meekly surrendered to the feisty 76-year-old former Gujarat Chief Minister and Prime Minister Narendra Modi’s close confidante. In his 13 years long uninterrupted rule, Chouhan (in)famously got along well with the successive State governors, including late Balram Jakhar, late Ram Prakash Gupta, late Ram Naresh Yadav and OP Kohli. Jakhar’s weakness was ‘luxurious life’ and Chouhan spared no efforts to ensure that the then occupant of the Raj Bhawan fabulously enjoyed such a life. Late Ram Prakash was too old and too ill to either enjoy luxuries or assert his gubernatorial powers. Late Ram Naresh Yadav, though a UPA government’s appointee, fell for the BJP Chief Minister’s inducements and, as a quid-pro-quo, chose to close his eyes to the omissions and commissions of the Shivraj government. He had earned the egregious sobriquet of ‘Shivraj Ka Agent’. It came as a little surprise to the State’s people that the then governor was also one of the beneficiaries of the Vyapam scam, the biggest job-and-admission swindle in the Independent India’s history. Yadav left the office disgraced and demoralised as a Vyapam scam accused. His son, also a Vyapam accused, had died while Yadav was in Raj Bhawan. The outgoing governor died in Lucknow soon after relinquishing the Bhopal Raj Bhawan. His successor OP Kohli, who is Gujarat governor, was holding additional charge of Madhya Pradesh since September 2016. Kohli seldom visited Bhopal during his additional charge. He had little interest in Madhya Pradesh and that suited the Chief Minister fine. No wonder then that all through his chief ministerial journey, Chouhan had become accustomed to mollycoddling tamed governors. None of them ever held the Chief Minister to account for his decisions, no matter how absurd, expensive or corruption-inducing these might have been. Madhya Pradesh has not had an “active” governor for many years—an incumbent who exercises the full spectrum of powers of the office as provided under the Constitution. 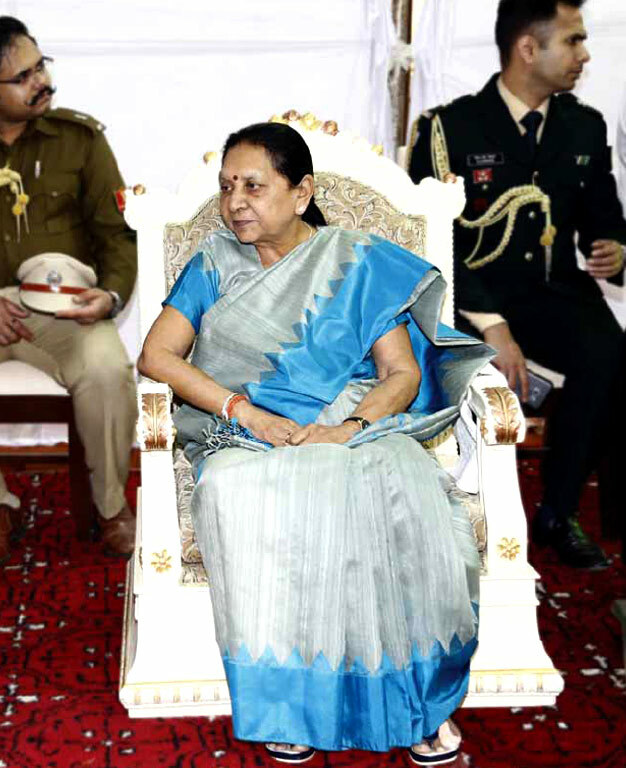 Anandiben, who was sworn–in as Governor on January 23, turned out to be altogether different from her predecessors. She sprung a surprise on the Shivraj government even before she took oath of the office. Soon after her appointment was announced, Anandiben left Gujarat on January 22 in a chartered bus along with her family and visited the Mahakal temple in Ujjain before reaching the State capital. She could have easily requisitioned the State government’s aircraft to reach Bhopal but she chose a bus. She refused State government’s official car as part of protocol when her entourage entered Madhya Pradesh border. Her journey fueled wild speculation about the new governor’s intentions. A few hours after her oath, she visited an aanganwadi centre in Bhopal, a juvenile correctional facility and a temple. The next day she visited cowsheds near Bhopal. Having thus hit the ground running, the Governor has not shown any letup in her proactive role so far. In fact, her assertiveness is growing, much to the chagrin of the Chief Minister. THE Governor’s warning has a context. Madhya Pradesh government has been dilly-dallying for over a year on handing over manufacturing and supply of nutrition food for malnourished children to anganwadis and self help groups. Madhya Pradesh High Court has repeatedly warned the State government to immediately end corrupt practice of getting nutrition food for poor children prepared and supplied through three big companies. Officers of the child and woman welfare department have been served defamation notices by the High Court, Indore bench, for disobeying the court’s verdict. The Governor’s sharp comment is being viewed as a warning to the nexus of contractor-bureaucrats-politicians which has been thriving on the multi-billion business. Chief Minister’s favourite bureaucrats are accu-sed of delaying implementation of the court order. Anandiben could not have been unaware of the massive corruption at the expense of the lives of millions of poor children in the State. Madhya Pradesh has the dubious distinction of having highest percentage of malnourished children among Indian states at nearly 60 per cent. Every year, thousands of children die due to undernourishment as the nutritious food meant for them reaches the targeted children in abysmally poor quality and quantity, if at all. The Governor’s stern warning has created massive flutter in the Shivraj government. A senior officer remarked, “This lady means business. The Chief Minister has trouble in store if he refuses to acknowledge the Governor’s warnings.” As a consequence, the entire system of food supply to anganwadis is being reworked with great earnest as per the high court order, according to sources in the women and child welfare department. Other departments have also heeded the Governor’s warning. A day after her meeting with the tribal welfare department, the government released Rs. 4.90 crore for construction of auditorium in the Raj Bhawan. Work on the incomplete auditorium was stalled for the last five years. On January 28, the Governor had hauled up a contractor and some officials over the delay in the construction. 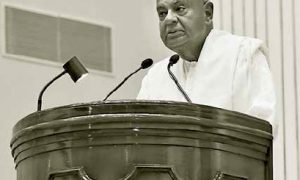 “I have been public works department minister for seven years,” said Patel, who had taken the oath merely five days prior. “Is this the way to do things?” In response, the Chief Minister asked to speed things up, signifying that her opinions and comments about the public works department, and in general, had the necessary political clout. 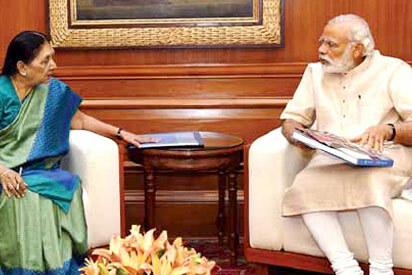 That Anandiben derives her political clout owing to her proximity to the Prime Minister was never in doubt. But her outreach to the bureaucracy has the Chief Minister worried, according to sources in the BJP. Sources say the Chief Minister is worried over speculation that the Prime Minister might go for simultaneous assembly elections in three States—Madhya Pradesh, Chhattisgarh and Rajasthan—along with Lok Sabha election. The assembly polls are due in November this year whereas Lok Sabha’s term is ending in May next year. Speculation is rife that after the term of the three assemblies ends in November, President’s rule for six months might be imposed there. This will enable the Election Commission of India to hold simultaneous elections to Parliament and three assemblies. Significantly, the Chief Minister has constituted a committee comprising politicians, bureaucrats and journalists to suggest feasibility of simultaneous election. 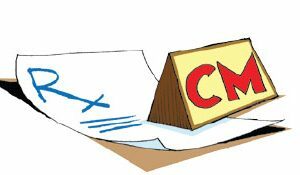 The committee, formed at the Centre’ behest, is to submit its report in three months. Should this speculation come true, next election in Madhya Pradesh will be fought under leadership of the Governor and not the Chief Minister. In the event, Shivraj, who is eyeing to retain his chief ministerial post for a fourth term, will not be projected as contender for the post. SHIVRAJ’S worries also stem from the perception that his loyalty to the Prime Minister and the BJP national president is doubtful. 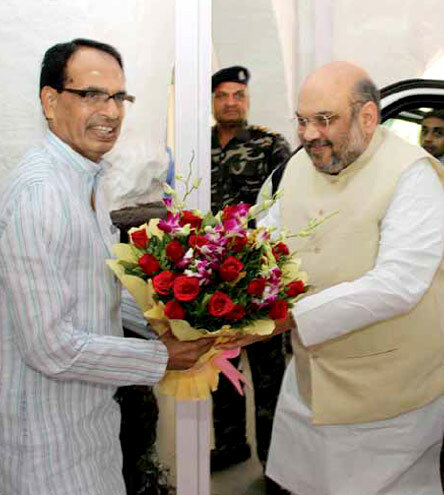 That Modi and Amit Shah dislike Shivraj is hardly a secret. Shivraj was once propped as a rival to Modi by LK Advani, the then-president of the party—something Modi had never been able to forgive and forget. Shivraj has desperately sought to curry favour with the Prime Minister by describing the latter as “god’s gift to the humanity” and ‘superhuman”. The Chief Minister managed to have the Prime Minister presence in over a dozen functions in Madhya Pradesh since 2014. However, Modi’s mistrust for Chouhan still persists. The trust-deficit has only grown as the BJP high command is reported to have serious doubts about the party winning the next election under Shivraj’s leadership. BJP’s defeat in successive assembly bye-elections has only reinforced the doubts. Anandiben Patel thus seems to have been sent there to keep an eye on him. She has strenuous relations with Shah but is on great terms with the Prime Minister, having worked in close proximity with him for years. Acting as his ears and eyes in the State, this helps Modi keep a check on Shivraj’s power. Anandiben, on her part, too has sought to give an impression that she indeed is close to Modi. She has no qualm in flaunting her proximity to the Prime minister, although she is supposed to be above politics being a Governor. 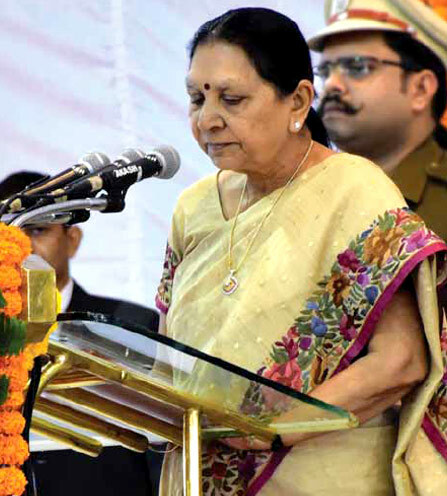 Crediting her success in politics largely to the Prime Minister, Anandiben once said the BJP gained power at the Centre due to Modi’s ability to select “committed” party workers. She remembered Modi during the launch of her biography, Karma Yatri, written by Ameya Latkar, in Ahmedabad in February in the presence of BJP chief Amit Shah and Gujarat Chief Minister Vijay Rupani, among others. “When I was a teacher before joining politics (in 1980s), I saved two girls from drowning during a picnic. After reading that news, Modi came to my house and asked me to join politics. That was the first time I met him. This is an example of how he used to find party workers,” 76-year-old Patel recalled. Patel said she had learned almost everything from Modi and his style of running a government. The Governor also saw an opportunity to show her loyalty to Modi in pakoda controversy. She waded right into the debate on job creation, with her explanation of how the opposition had misconstrued Modi’s remark on why a person earning Rs. 200 a day selling pakodas can be considered employed. Making pakodas is a skill that could be stepping stone to a flourishing business, the 76-year-old reasoned while addressing a function in Chhindwara. PM Modi had made the remark in a television interview to illustrate the point that the debate on job creation should not only account for the number of jobs created in the organised sector but look at generation of employment. 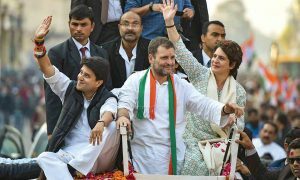 Initially, her appointment was seen primarily as a measure to placate the Patidar community in MP that has been upset after the Mandsaur police firing in June. Six farmers from the community were killed in the firing during the farmer stir for remunerative price for their crops. However, as she started summoning bureaucrats, attending public functions and reviewing academic calendars of the state universities, it became increasingly that the Prime Minister has sent his close acolyte to fix the Chief Minister. Immediately after taking oath, she asked the Raj Bhawan principal secretary to computerise the movement of files instead of keeping records in manual registers and directed vice-chancellors to prepare academic calendars. She has jolted the Chief Minister to act on issues his government usually shies away from. The Governor’s office has become a forum where grievances against the government are being reported. A school principal before she first became a Rajya Sabha member in 1998, Patel has been a three-time legislator in Gujarat. She became Gujarat Chief Minister after PM Modi took charge in 2014 but had to step down in 2016. Although she is no longer the Chief Minister, she appears to be keen to wield the power vested in the post in a different role and in a different State.